http://Summertime excitement awaits your family across all four Walt Disney World® Theme Parks. There’s the newest and most magical Disney fireworks show ever, Happily Ever After, at Magic Kingdom® Park. And there are unforgettable attractions like Frozen Ever After at Epcot® and Toy Story Mania!® at Disney’s Hollywood Studios®. Plus, prepare to go to an entirely new world. A world beyond belief at Pandora—The World of Avatar! 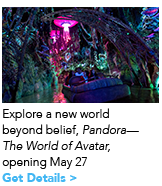 Beginning May 27 at Disney’s Animal Kingdom® Theme Park, you’ll fly on the back of a banshee, navigate a mystical river, hike underneath floating mountains and more. There’s no better time than summertime to visit Walt Disney World® Resort—and no better time than now for your chance to win a vacation to do just that! And make sure you join Patty Jackson as she broadcasts live from Disney on Thursday and Friday, May 25th & 26th only on 105.3 WDAS. 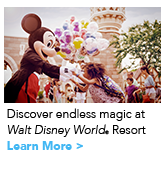 Register below for your chance to win a family getaway for four to Walt Disney World® Resort from WDAS! Airfare provided by Southwest Airlines®.